In this video you'll learn how you can duplicate an existing listing. Reasons you may want to duplicate a listing include creating a new listing that is nearly identical to an existing listing on your account. When you duplicate a listing, the newly created listing will not have an image or time slots, so you'll have add those separately. Click on "More" and select the "Duplicate" option. 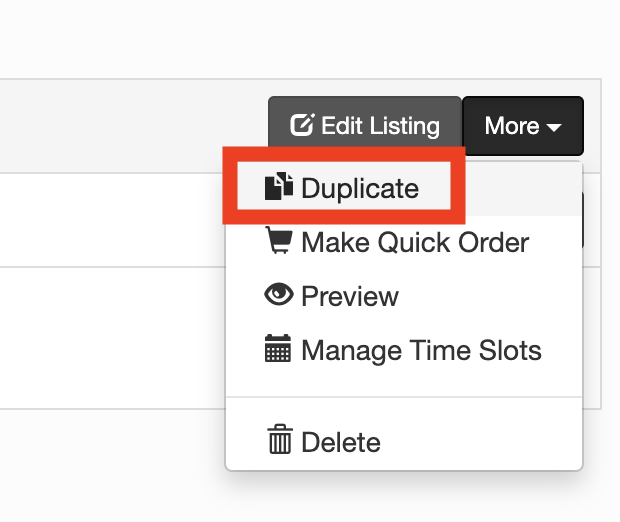 Select the venue where you want your new listing to appear and click "Duplicate"
You now have a duplicate of your original listing. Change the title, description and image, and add the time slots associated with your new event.